Pale Fire isn’t on my official Reading List, but I’m on a Nabokov kick and might as well enjoy it. Unfortunately, there’s a fairly limited amount you can say about this book without getting into serious spoilers. It’s a novel with a unique structure, consisting of a 999-line poem in heroic couplets followed by extensive notes on the poem by a highly dubious literary editor. The poem, ostensibly by a minor literary figure named Shade, is autobiographical, down-to-earth, and by turns comic, wry, sad, and wistful. The commentary, by Shade’s neighbor, colleague, and sycophant Kinbote, often takes little notice of the poem itself, using it rather as an arbitrary setting-off point to tell a (probably) (completely) unrelated (tragicomic) story of its own. A preface by Kinbote, which is the first text we read, starts out with a straight enough face, but by the fourth paragraph is signaling vigorously that its author may be a few bricks short of a load. Let’s start with the poem. It’s quite amazingly good! Which is not to say that it is the best poem ever written in the English language or anything; however, it is a believable approximation of the kind of long piece a respected American poet might crank out towards the end of his life. It needs to be that for the book to work, but at the same time it is an especially impressive achievement when you consider that it was created not in and of itself but to be part of a larger whole. In this paragraph I shall up the spoiler content a little, and turn to the commentary. Now, it is always unfair to criticize a book for being different from the book you hoped for. Still, I had heard that in Pale Fire one gradually came to understand that the commenter is a little off his rocker, and that’s not so. He is in fact fairly bonkers right out of the chute. So, while it is unique, funny, and pleasantly weird, Pale Fire is not nearly as subtle as I hoped it might be. And now, it’s pure spoilers from here on out. Kinbote’s annotations, as I mentioned, mostly serve to tell out a sprawling story that has little obvious relation to Shade’s poem. The real gems, though, are those that more closely approximate standard editorial notes. Since Kinbote is a bit dim, is disinclined to do a lick of research, and does not really grasp American culture, his stabs at exegesis are either profoundly banal – at one point, he explains who Sherlock Holmes is – or woefully inaccurate. It’s academic slapstick, but it’s good academic slapstick. Who wrote the texts? Well, Nabokov, of course. But within the fictional frame of the novel, it is not necessarily a slam dunk that Shade wrote the poem and Kinbote wrote the commentary. Kinbote is (arguably) so bonkers that one could easily imagine him writing the poem himself, or cribbing it from some other source, and inventing John Shade out of the same (possibly) thin air from which he creates the rest of his (possible) fantasies. But then, Shade’s persona as we perceive it through “his” work and “Kinbote’s” anecdotes suggests the kind of irreverent creative mind that might contrive an imaginary and artistically abusive editor of his own work, just for the hell of it. Who is Kinbote, anyway? Well, like I just said, he could be Shade’s whimsical sock puppet. But that’s not the most obvious interpretation. The most obvious interpretation is that Kinbote is delusional, that he has imagined a glamorous past for himself as the deposed king of a nonexistent Eastern European country, Zembla. But wait – this is a book of fiction, and it is entirely within bounds in a novel for a country that does not exist in real life to be fictionally "real." (Tolkein, for instance, does not intend for us to assume that Frodo is insane because he believes that The Shire exists.) It is possible that Zembla exists in the Pale Fire universe, and that Kinbote has delusionally fixated on its disposed king in the same way that women used to convince themselves they were Anastasia Romanov. Or, Kinbote could be telling the truth about himself throughout, and be the actual deposed king of an actual Zembla. Incidentally, Nabokov said in an interview that Kinbote is actually a deluded member of the Russian department of the university at which Shade teaches, an extremely minor character whom is glancingly mentioned a few times in passing. Except, he said this in real life, not within Pale Fire, and as such his comment tells us something about what Vladimir Nabokov’s intentions were but nothing about who Kinbote is. Nabokov also said that Kinbote commits suicide after the book is over, but how the hell would Nabokov know that? Kinbote might well seduce a student and move out to L.A. after my copy of Pale Fire is over. About that Russian department, though – we learn, very incidentally, that its chair is Professor Pnin, who we last saw at the end of Pnin leaving his previous institution in frustration and ignominy. He is said to rule his new department with a pedantic ruthlessness, which if you read Pnin you know he’d really, really enjoy. It’s nice to see Dr. Pnin land on his feet. 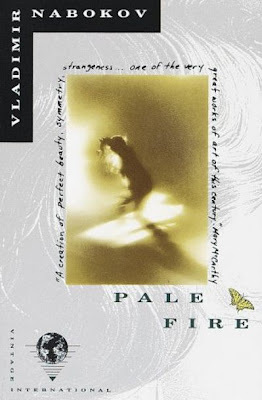 But this kind of literary interpenetration is just a kind of bookish Easter egg, and doesn’t really have much to do with the larger themes and ideas lurking under the whimsical surface of Pale Fire. Or does it? Ah - the Prisoner of Zembla. "A real hoot!" says the "wife" of "Michael5000," whoever he might be.